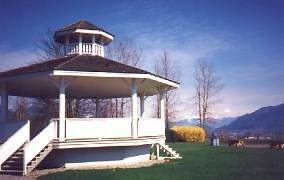 In the heart of the Fraser Valley is the city of Mission, British Columbia, named after St. Mary's Mission, founded in 1861 to spread Christianity to the local natives and control rowdy miners on their way to the gold fields. But the area's history goes back much farther than that. For thousands of years people have been stopping along the shores of the Fraser River to build homes and take advantage of the abundant salmon, towering cedars and bountiful berries and game. At one time the railway line at Mission Junction was the only rail link between British Columbia and the U.S.; the original station is in the process of being restored to keep alive that part of Mission's history. In nearby Harrison Mills, visitors can browse through the Kilby Historic Store and Farm. There is also a map of historic buildings throughout Mission that is available through the Tourist InfoCentre. Whether you want to walk through a series of scenic waterfalls, hike or ski the nearby trails or fish in the many lakes, the outstanding mountain, river, lake and valley views with their accompanying year round recreational opportunities, the town's many events and the preservation if its history makes Mission a place for all. Accommodations: There are a number of hotels and motels accommodation in the city of Mission plus private and provincial campsite close by. Elevation: 12 m. (39 ft.). 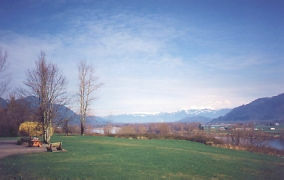 Access: Access to Mission from Vancouver, BC, is either along the TransCanada Highway and turning north at Abbotsford or following Highway 7 (71 km/44 mi.). The area is serviced by bus and rail lines. 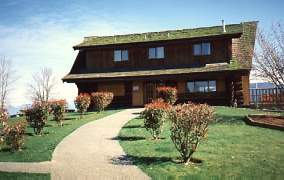 Recreation Facilities & Activities: golf course, raceway, walking trails, baseball diamonds, horse shows, parks, beaches, boating, fishing, bird watching, horseback riding, downhill and cross country skiing. Local Attractions: Fraser River Heritage Park, Museum & Fire Museum, Mission Raceway, Cascade Falls Regional Park, Hatzik Rock (archaeological site), Heritage Park evening concerts, Rolley Lake Provincial Park, Ruskin Dam Recreation Site (spawning channel), Cascade Falls, Matsqui Trail Regional Park, Hayward Park Conservation Area, community theater, Westminster Abbey, Inch Creek Fish Hatchery, Hemlock Valley ski resort, Stave Falls Dam. May - Art show, Mission Hill Stomp Run, Horse Show, Heritage Park opens.